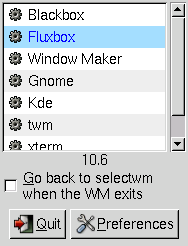 Here, you can find free software written for linux (but it should also run under other operating systems). You are free to distribute this software under the terms of the GNU General Public License (GPL). 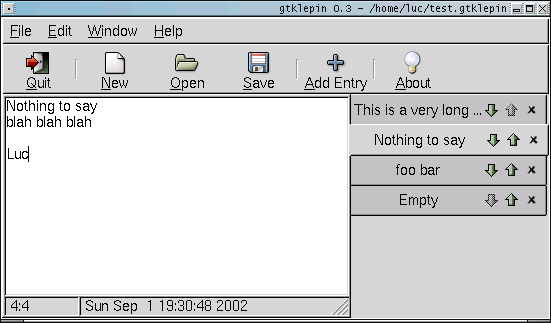 Gtklepin is a notebook that uses the GTK+ toolkit. It has similar functionality to the notebook found on the Psion Revo PDA. Guiftp is a simple FTP client using the GTK+ toolkit. It actually can connect to a remote host, download and upload files and directories. It supports interrupted transfer. Bookmarks are working. And you can do the usual operations: erase files and directories, create directories, erase directories recursively... on both the local and the remote computer. Crypt a password using md5. Add an user to an AuthUserFile in proftpd. This script uses the above one.